This insightful and entertaining book focuses on the movies of Johnny Depp made between 2005 and 2013. 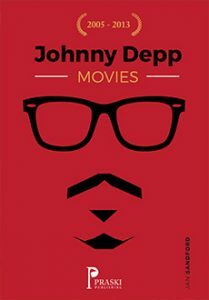 This insightful and entertaining book focuses on the movies of Johnny Depp made between 2005 and 2013. Each movie is reviewed in detail without giving too much of the plot away but giving an opinion of its strengths, weaknesses and points of interest. As well as a short introduction and mini biography written by the author, who is a lifelong fan, facts such as release date, box office takings, locations and cast are also covered however, the main focus is on Johnny himself – written by a fan for fans. Essential reading for any Depp devotee or just interested movie fans.